Press Release - Belmopan - November 1, 2012 - A memorandum of understanding was signed on Wednesday, October 31, 2012 between the Ministry of National Security and the Steering Committee of the Peninsula 2020 Initiative outlining the terms which the Police Department will operate a mobile checkpoint at various places on the Placencia Peninsula with the support and cooperation of the residents of the Peninsula. The Peninsula 2020 Initiative is a joint undertaking whose steering committee has broad-based community representation from the Placencia and Seine Bight Village Councils, Placencia BTIA (Belize Tourism Industry Association), Placencia Tour Guides Association, Placencia Tour Operators Association, Peninsula Citizens for Sustainable Development, Placencia Fishermen’s Cooperative, Southern Environmental Association and Placencia Peninsula Community Crime Watch (PPCCW). Signing on behalf of the Ministry of National Security and the Police Department were Hon. John Saldivar and Police Commissioner David Henderson. Signatories for the Peninsula 2020 Initiative were Placencia BTIA Chairman, Stewart Krohn and Placencia Village Chairman, Charles Leslie. 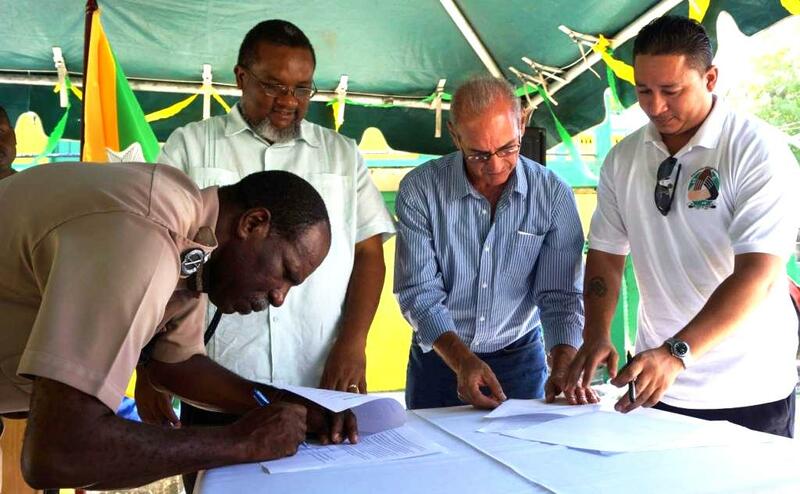 The signing of the memorandum took place at the Queen Street Police Station in Belize City.